As you may know, I have a penchant for puzzles, and find it hard to leave them unsolved, so I thought about it and came up with an answer. I thought I would jot down my thought process here. A point is chosen at random inside the larger of two concentric circles. The probability it lies outside the smaller one is 0.84. 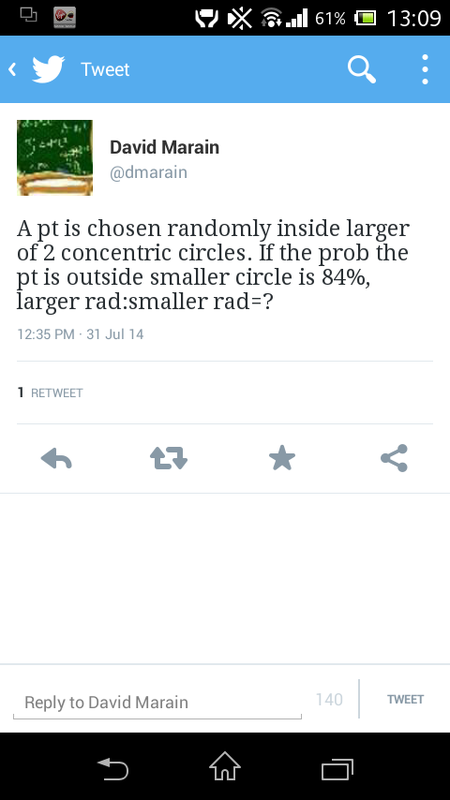 What is the ratio of the larger radius to the smaller radius? It’s a lovely little puzzle that combines a bit of geometric thinking with probability theory, so do have a little go first. A nice little solution to a lovely puzzle. Thanks for sharing David. Nb: no photo of envelope workings as I did it mentally. Stem and Leaf – is there a point? Stem and leaf diagrams, or “Those leafy stem things”, as one of my former pupils used to call them, have long been an annoyance of mine. I’d never heard of them until I was brushing up on the GCSE syllabus ahead of my PGCE and when I did come across them I couldn’t see anything that they brought to the party that couldn’t better be shown using alternative methods. You can imagine my feelings then as the KS3,4 and now 5 curricula jettisoned them, meaning the end was in sight for the need to teach them. I let my feelings on this be known in my recent post around the new A level curriculum and this led to further discussion around them on twitter. Then Jo Morgan (@mathsjem) wrote this fantastic piece which supports their place in a classroom and gives some great activities to use in teaching them. It got me thinking, are my feelings unfounded? Should I be writing off stem and leaf diagrams? I’ve long been an advocate of maths for maths sake, see this defence of circle theorems for one example, so why is this feeling bot the sane for stem and leaf? Perhaps it’s that it falls under the banner of “stats”, a very applied area of maths. This suggests that there should be an application associated with it. The use mentioned in Jo’s blog for bus and train timetables is the best example I’ve seen, but I think a normal timetable will be easier to read for the majority if people, as the majority of folk aren’t familiar with stem and leaf. Hannah (@missradders) suggested that they were used a lot in baseball, but I can’t see any reason that they would be better than a bar chart or a boxplot. I really enjoyed Jo’s post, if you haven’t read it I would advise you do. It made me think and look hard at my views. In the end though, I still see no need in stem and leaf diagrams and will be glad to see the back of them. If you have opinions either way I would love to hear them, especially if you have further real life uses! So the drafts of the new Maths and Further Maths A-Level courses have been released and the Department of Education and Ofqual are in a consultation period. (You can download the drafts and find more details on the consultation on it here. )I am left pondering the rationale behind the summer holidays consultation periods that the department seem so fond of, you could say it is an attempt to reduce consultation as most involved with education are on holiday and not thinking about work. Or you could say it was to give those same people more time to consider it. I think it will probably reduce the amount of responses. I have had a quick read over both drafts, and wanted to make a few initial remarks here. I will be spending some further time on these and putting together a fuller response to them as part if the consultation, which I will also publish here. The big change is, of course, the switch from a modular to a linear course. This has also been coupled with a,switch to a course that us 100% prescribed. I think that a linear model may be better than a modular model, but I did like the choice element offered previously. Students with no interest in physics who want to study psychology or biology etc don’t necessarily need mechanics, and would benefit from doing a course that is more stats heavy. Likewise, a student who wants to go into physics would benefit from a heavier mechanics load in their qualification. These seem to be fairly similar. There is a bigger focus of set theory, which I feel us good. I was disappointed not to see more of this on the reformed GCSE. There appears to be a bigger emphasis on proof, it mentions contradiction, exhaustion, deduction, but no specific mention of induction. A stronger emphasis on this can only be good. This section also alludes to a bigger emphasis on problem solving and modelling, which is one of the main applications of mathematics, so more focus here can’t hurt either. There is more mention to modelling throughout, and it looks as though they have brought linear programming into the algebra section, which also includes a bit around looking at transformations of the normal curve. The rest of the curriculum which pertains to the current core modules is very similar. Solids of revolution have gone, and been replaced by newton-raphson, but that seems to be it. The stats has lost some if the nonsense involved currently (an end to stem and leaf! Hurrah!) and is more focused on the important bits, like probability theory and the two big distributions (Normal and Binomial). The mechanics section looks exciting. It is based around forces and kinematics (of course) but is more advanced than the current m1, incorporating the calculus that doesn’t come into the current mechanics course til m2/3. There is no mention of graph theory, the best part of the current D1 module. I think that’s a real shame as it is newer than the majority of the syllabus and is vastly different to what students have learned before now. I know that universities were keen for this to be on there. Something else the unis wanted to see on the a level was an intro to Matrices and Complex Numbers. These are two topics important in many courses (engineering, computing, etc) and they have to be taught at the start of such courses, so I was expecting to see these, and would have liked to see them too. Unlike the Maths course, this one includes an element of choice, kept up to the exam boards. There is core content listed but this only accounts for 50% of the course. This gives the boards an opportunity to diverge. Surely we will see graph theory here, and hopefully game theory, knot theory, perhaps caos theory?! Will any be brave enough to include quaternions?! There could be massively different courses between boards, or they could all go with the same, safe choices. It looks to have a good basis, covering complex numbers, matrices, hyperbolic functions, polar coordinates (Grrr) and builds on the topics from the Maths Alevel such as calculus, vectors and differential equations. I was expecting a massive change to the curriculum. When the review finished for the other subjects we were told maths would be released later as it needed the mist significant changes. But the changes to the curriculum are not massive. The majority of the core maths is still there and the major bits of stats and mechanics are there. The most significant change is the switch to a 100% prescribed curriculum, something I can see arguments for and against. Similarly, the further maths core content is the same as it currently is. The 50% left to exam boards could be the same as we have now, or could be radically different, depending on the courage of the exam boards. We won’t have a solid answer until they release their materials. Right at the end of January I wrote this piece reflecting on 2013 and looking forward to 2014. There were a lot of others doing the same and it was nice to read all the reflection going on and to see people’s hopes for the year ahead. osts and would love to hear,some mid year progress updates. Again, many others have done this and I’ve enjoyed reading them so I thought I would jot a few things down here. I have continued to watch my daughter grow, my partner and I have both enjoyed the education we are receiving and I do feel it is positively impacting my classroom practice, so they’re all ticked. We have also finally set a date and my daughter is looking forward to being a flowergirl. I have been to more teachers, I did attend northern rocks and I also went to the ResearchEd York conference. All of which have been great and have helped. As you can see, I have continued this blog and I feel that us helpful too. I have managed more reading and to investigate more areas of maths, but not as much as I would have liked, I guess this is still a target! I’m fairly pleased with the new Maths GCSE Curriculum, it’s more rigorous and challenging than the previous one. I’m also pretty stoked about the proposed Progress 8 measure which I hope will take us away from the threshold pass. Now that Gove has gone all bets are off! I’m worried about the new Education Secretary, but am prepared to wait before making a judgement. It’s too early to tell if the new ITT systems will help retention, but 2014 hasn’t yet seen the amount of teachers I know leave the profession as previous years, so that at least is positive. When I wrote that blog in December I had no idea that I’d be sat here today having spent my last day at the school I was at. It’s a crazy feeling. It all happened so fast, and although I’m majorly excited about the new challenge that waits at my new school I’m also pretty say about leaving too. I wrote briefly about leaving here, but even then I didn’t quite realise what it would feel like when it finally came. Saying goodbye was hard. It was really hard to say goodbye to year 13, the yeargroup included some of the most amazing people I’ve ever known, but at least this was inevitable. I would still have had to make those goodbyes, with my other classes it felt like a premature goodbye. My year 12 class have spent the time since I told them I was going guilt tripping me, to great effect I might add, and it was incredibly hard saying goodbye to them. My year 11 class was another particularly hard goodbye. It’s a strange one this, it’s one that in one teaching years has felt a natural goodbye, but this year the vast majority of them are staying on at sixth form and around three quarters of the class have provisionally chosen maths Alevel, so it did feel premature. Two of them called into see me on Thursday and that was really nice. All my other classes were hard too, but particularly my coaching group. I’ve been their coach since they started the school in year 7 and I’ve seen them all grow from timid little children into confident young adults. I feel really guilty that I’m leaving before they have finished year 11, and I know they were all upset, but I think they understand. Then there is the staff, over the years I had been there I have build many great friendships, and I will miss seeing those friends on a daily basis. And I will miss the afterschool joint planning and chatting sessions that happened on an almost daily basis too. The last day was emotional, especially the last coaching session and the speech my friend and (now former) colleague gave about my leaving that had me both in hysterics and on the verge of tears. I think I need the holidays to recover. Looking forward I see excitement. I’m starting a new role. The school seems like a good fit for me, the role us definitely a good fit and I think the team I’m working in will be too. I’ve got more responsibility, and a brilliant timetable. I’m already excited about some potential conferences and I’m really looking forward to the second year of my masters course. This is a book that I have found extremely helpful both in improving my teaching and in my studies. I first heard about it through reading other people’s blogs, I saw many references to Hattie from lots if people so I investigated and the book is superb. It’s not maths specific, so I would advise any teacher to pick up a copy. In the book Hattie looks at the wealth of literature that exist on education and uses it to create a book that has plenty of great advice we can all learn from. Regular readers of this blog will know already how I feel about this book, it’s my favourite if all time. It’s a book that charts the development of maths over the course of history and includes some excellent anecdotes about the mathematicians involved. Why do I think maths teachers should have it? There are tons of reasons! Firstly, pure enjoyment. If you are a fan of maths you will love the book. Secondly, it may widen your subject knowledge (certainly will first most maths teachers) and give you stories about the development if maths and the mathematicians you can share with your classes. Thirdly, you can lend it to students and see their love of maths grow. This one is a book of resources. I discovered them on my PGCE year and have loved them ever since. They are tasks that give written instructions and students need to follow them, work out what maths to use and solve the puzzles. I have enjoyed doing the puzzles and think they are excellent for pupils, especially for revision purposes in the build up to exams. The title suggests they are to be tackled in teams, but they work well as individual activities too. Certainly beneficial for maths teachers to have a copy! This is another book which isn’t entirely maths based. I happened across it while researching a masters assignment on classroom talk and it revolutionised the way I approach talk in lessons. Alexander has spent a lot of time researching the area and makes a lot of fantastic points. A worthwhile purchase for any teacher. This is an awesome book, which is also freely available ebook, that all maths teachers should read. I have listed Tina Cardone as author as she put it all together, but in reality she is one of many many contributors. The book looks at the tricks employed by somepeople in the learning of mathematics, and the dangers that they can have in causing misconceptions to arise. I only recently discovered this document, when I wrote this piece on the problem with BIDMAS, but only have thoroughly enjoyed it and hope it goes some way to eradicating these problems that arise when people choose to teach the tricks over the underlying concepts involved. For my other post on this see here. These are five books I feel would improve maths teaching. I haven’t read every book there is on maths, or teaching, yet. I could have named a yon more that would fit! There are no doubt tons more I have yet to read, so if you have any suggestions I would love to hear them and add them to my “to read” list. I was going to call this piece “Goodbye, Mr Gove”, but Old Andrew (@OldAndrewUk) has already written this one with that title. I read his post, really enjoyed it and agreed with the majority of it. But that’s not what I wanted to write. This mornings announcement was a total shock, one from which I still haven’t really recovered! I wanted to have a look at some of the policy decisions that have happened during Mr Gove’s tenure and explore my feelings on them. I have tried to write objectively, and not taint my feelings on these policies with my feelings of Gove himself. I haven’t researched specifically for this post, all the measures here are from memory. If I’ve attributed something wrongly, or remembered it wrong, I do apologise. Feel free to correct in the comments and I will amend. Progress 8 is something I have been meaning to blog about for a while, and I will blog in more detail soon. I think it is the single best piece of Education Policy in recent history and I have high hopes that it will eliminate the idea of a threshold pass which is detrimental to pupils. I truly hope that this measure doesn’t get scrapped by the incoming Education Secretary. The new secondary maths curriculum is, in my opinion, much better than the current one. It includes much more challenge for the most able and is far more rigorous. I have every faith that it will provide a much better grounding for A Level maths than the one we have at the moment. My only criticism is that it doesn’t go far enough. There are still some highly irrelevant topics (Why do we need to perform translations by hand in the 21st century?) and I would have loved to see basic Calculus and an intro to Complex Numbers included. I’m yet to see the draft A Level curriculum, but I have high hopes for it. I feel tat Complex Numbers need to be included in A Level maths, and not just be kept for further maths. I’m fairly excited about the core maths qualification and hope that all these curriculum reforms lead to more people continuing with maths post 16 and post 18. I think this one is a terrible policy. It is open to abuse and could cause all sorts of trouble within schools. Teaching should be full of collaboration, but this runs the risk of pitting teachers against each other and causing people to share, and collaborate less. People may be less willing to help out a colleague in the fear that their results will outshine their own. I am a fan of this piece of policy. We had a ridiculous scenario where pupils were sitting their GCSE 6 times in some school before the end of year 11. The whole of their year 10 and 11 maths lessons were geared towards “hitting the c” and many potential A Level candidates were put off maths and many who could have scored A’s and B’s were never taught the higher stuff because of the regime they were in. It also gave rise to classes where pupils had reached grade C at the end of year 10 and had then decided that that was good enough, so they refused to do any further work. Meaning that students who should and could have scored A’s and A*’s reached KS5 with only C grades. I know many students this year who had C’s but re-sat their maths GCSE as they needed B’s to get onto the courses they want to study at university. This is a strange one. I have long been of the view that sitting all exams at the end of the year if of the most benefit for the students as once the whole course is completed they have a deeper understanding. In maths A Level C1 becomes really easy once you have studied C3 and C4 for instance. But on the other hand, ever year the January exams provide a reality check for many who walked the GCSE exams without working and thought they would be able to do this with A Levels. This may be off set in the long term by the tougher GCSEs, and IU think that Mocks done properly could recreate this effect. This is, quite frankly, a ridiculous policy. I’ve written before about my feelings on this matter, but to sum them up I would say that I think ever teacher should have had, or at least be having, some basic training. I’m fine with the schools direct/teach fist model of learning while teaching, but I think that this should be the minimum. I also feel that all teachers should be in control of their own CPD. I don’t like what Gove stands for, I don’t like his Party and I don’t like his Ideology. I wouldn’t, however, say that everything he has done has been terrible. Slagging the Education Secretary off for every move he makes is something that has happened for as long as I can remember, and I think we need to start assessing policies on their own merits, not on who puts them forward. Gove is a fantastic orator and is brilliant at polarising public opinion. He has brought Education to the forefront of the minds of most people and raised its profile no end. I find some of his policies abhorrent, but I also find some of them to be fairly good. And I hope beyond all hope that when Nicky Morgan puts her own stamp on the portfolio that she doesn’t cancel Progress 8. I know very little about Nicky Morgan, I read her voting record this afternoon and baulked at it, particularly her major opposition to equal marriage. She rarely rebels (5 times out of 955 votes), which suggests she is agreeable to all the governments policies, or is happy to tow the line to further her career. On Education matters she has gone with the government on all major votes. She has little background in education, which means she is even further removed from the classroom than Gove, who at least had studied it as shadow minister for years before taking office. I only see things getting worse under her. I said to a friend last week that Tristram Hunt needed to get up to scratch fast, come up with some policies and be ready to take on Gove at the dispatch box or he would run the risk of losing the debate ahead of 2015. I think the conservatives have done him a favour here, and now is the time for Labour to put forward their views on the education portfolio and take a lead on driving future policy. I’d love to hear your views on the Govian years. I’m sure I’ve missed some major policies here, but here are the ones that stuck in my mind. Someone responded to my post with a tweet which linked to “Nix The Tricks“, which is freely available as an ebook, and I downloaded and read it. The book itself is great, it is a collaborative effort by many maths teachers who share my frustration with the problems that teaching this sort of “trick”, rather than deeper understanding, can cause. The book has been put together by Tina Cardone (@crstn85). Tina and her collaborators go one step further that venting about the tricks and offer some brilliant alternative methods to help teachers who haven’t thought in detail about how to teach certain topics. Its a fantastic book and I would advise any maths teacher to download a copy, especially those new to the profession.